This paper presents an efficient simulation method for parallel cloth simulation. The presented method uses an impulse-based approach for the simulation. 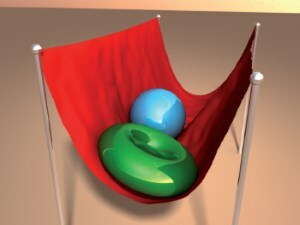 Cloth simulation has many application areas like computer animation, computer games or virtual reality. Simulation methods often make the assumption that cloth is an elastic material. In this way the simulation can be performed very efficiently by using spring forces. These methods disregard the fact that many textiles cannot be stretched significantly. The simulation of inextensible textiles with methods based on spring forces leads to stiff differential equations which cause a loss of performance. In contrast to that, in this paper a method is presented that simulates cloth by using impulses. The mesh of a cloth model is subdivided into strips of constraints. The impulses for each strip can be computed in linear time. The strips that have no common particle are independent from each other and can be solved in parallel. The impulse-based method allows the realistic simulation of inextensible textiles in real-time.